I love this month’s Recipe ReDux theme because it got me thinking of ways I can branch out and try some new packed lunch ideas. I’m lucky to have a fridge and microwave at work, so almost any meal works for me. If you don’t have that luxury, this meal tastes great chilled! You can pack the seasoned turkey filling in a plastic container, lettuce in a zip top bag, and pack it all in a lunchbox with an ice pack! I tried making a shortcut tuna fish version of this. Let’s just say that recipe is still a work in progress ;) This version is good to go! I’m happy with the addition of chopped spinach and grated carrots. You get some extra veggies and flavor that way! Cook the ground chicken (or turkey) in a large nonstick skillet over medium-high heat, breaking up the chunks with a spatula and stirring frequently until no longer pink. This should take about 5 minutes. Add the chopped spinach, grated carrots, and diced water chestnuts. Continue to stir and heat until everything is hot and bubbling, about 2-3 minutes. Add the remaining seasonings (hoisin sauce through green onion), and continue to stir to combine the flavors for another 1-2 minutes. 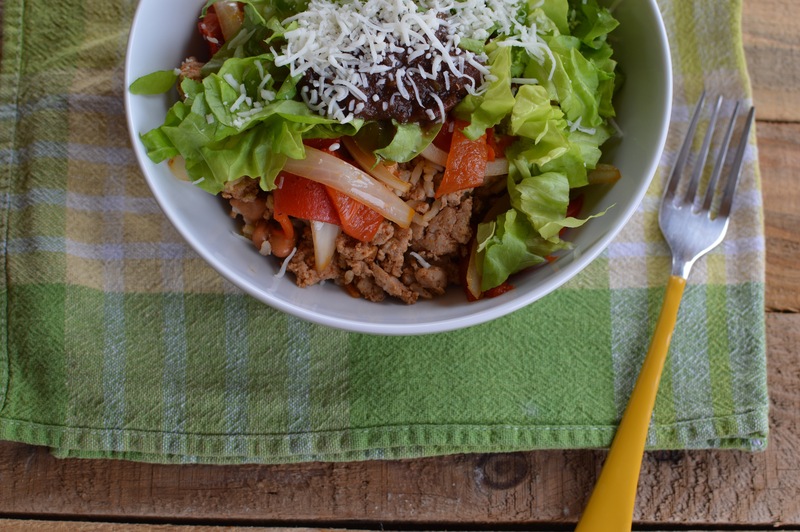 Scoop into leaves of butter lettuce and drizzle with sriracha sauce if you like it spicier! 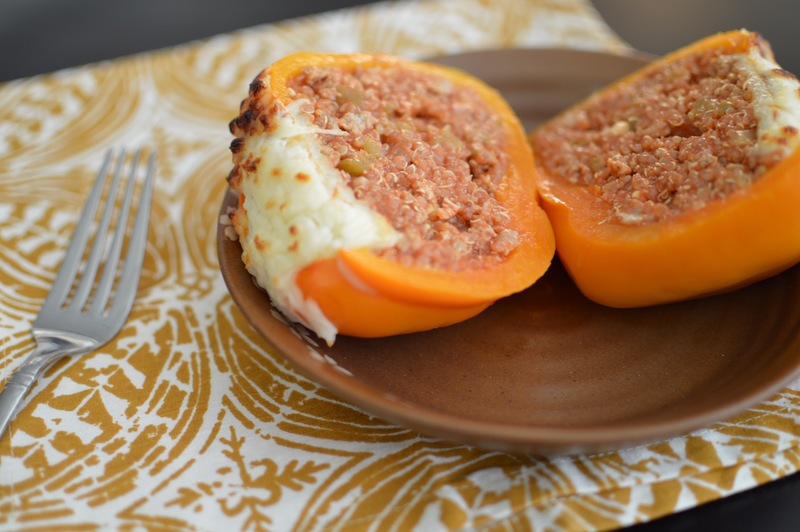 Check out more lunch ideas in this month’s Recipe ReDux linkup below! Honestly, that’s about as far as I got in my research before realizing I can totally handle this and so can you! So let’s get right to it. My very first freezer meal is a seasoned turkey burrito bowl. 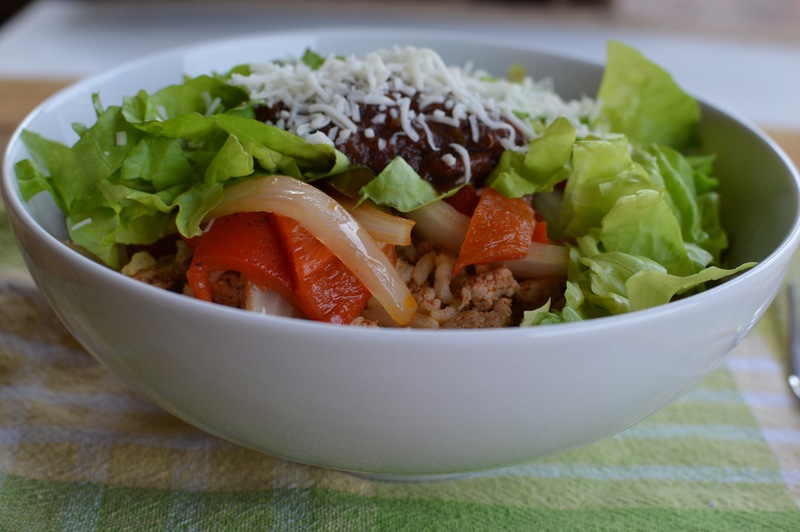 I chose this recipe because you can easily freeze each component separately to use in other dishes if you get tired of eating burrito bowls. I was also inspired by the cooking philosphy in the cookbook “Well Fed,” in which Melissa Joulwan does all the chopping of vegetables and cooking of meats on Sundays like a CrossFit workout for time and then assembles the prepped ingredients on weeknights to finish off her meals in just a few minutes. Thinking of meal prep as a timed workout helps to make the process more efficient! By the way, if you’re cool with eating the same thing every night, you could store this meal in the fridge instead of the freezer and enjoy dinner for one 5 nights in a row. 1. Brown the ground turkey in a 10″ skillet, breaking it into crumbles until no longer pink inside. Add taco seasoning and stir to thoroughly coat the turkey. Set the meat aside to cool. 2. Cook the brown rice on the stovetop or in a rice cooker by combining 2 and a half cups of water with the cup of rice, bringing to a boil, and reducing to a simmer until all liquid is absorbed (30-45 minutes). 3. Heat the olive oil in a 10″ skillet over medium high heat. Once hot, sauté the vegetables until they begin to soften and caramelize, abot 5 minutes. 4. Divide the ground turkey, cooked brown rice, sautéed vegetables, and black beans among 5 sandwich sized zipper bags or pint sized plastic freezer containers. Freeze until ready to serve. 5. When ready to eat, transfer the contents of the freezer bag or container to a microwave safe dish and defrost according to microwave instructions. Alternatively, you can thaw the contents of the freezer bag/ container in the fridge during the day and zap for a minute or two on high power when ready to eat. 6. Top with shredded lettuce, salsa, avocado, shredded cheese, and/ or sour cream and serve! That really wasn’t so bad! I don’t have much freezer space, but I’m excited to try some more freezer meals for a family of two. Pre-prepped meals will definitely be useful over the next few months while I’m studying for the MCAT and have no time to cook! January’s Recipe Redux theme is “Start Smoking in the New Year!” The idea is to flavor up recipes with a bit of smokiness or spice. 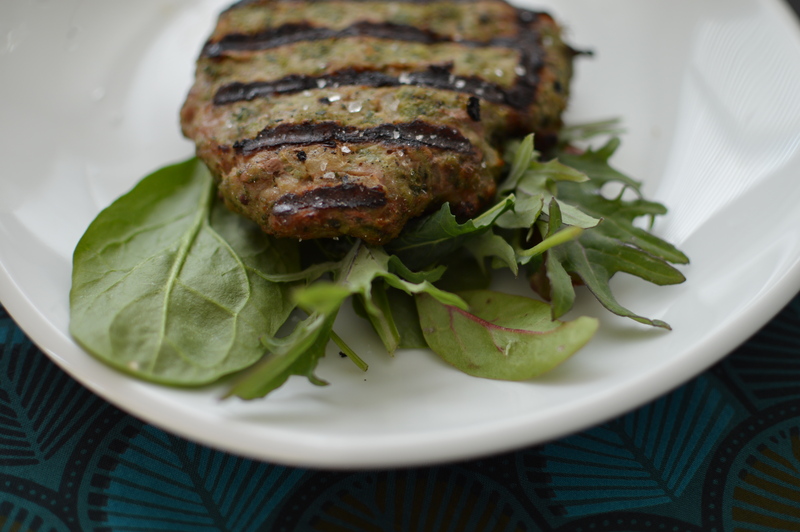 My base recipe was a turkey burger, but I wanted to find a way to bulk it up with extra vegetables and impart a smoky, savory flavor. I loved thekitchn.com’s guide to adding smoky flavor to foods! I used a few of the ideas listed for my turkey burgers. I also added some pureed vegetables leftover from my juicer to make the burgers extra moist and nutritious. If you don’t have a juicer, you can use any of your favorite grated or pureed vegetables! 1. Gently fold together all ingredients in a mixing bowl until well incorporated. 2. Wet your hands to form the mixture into four 4″ diameter burger patties. Refrigerate for 20 mins – 2 hours to allow the flavors to combine. 3. Preheat the grill to medium-high. 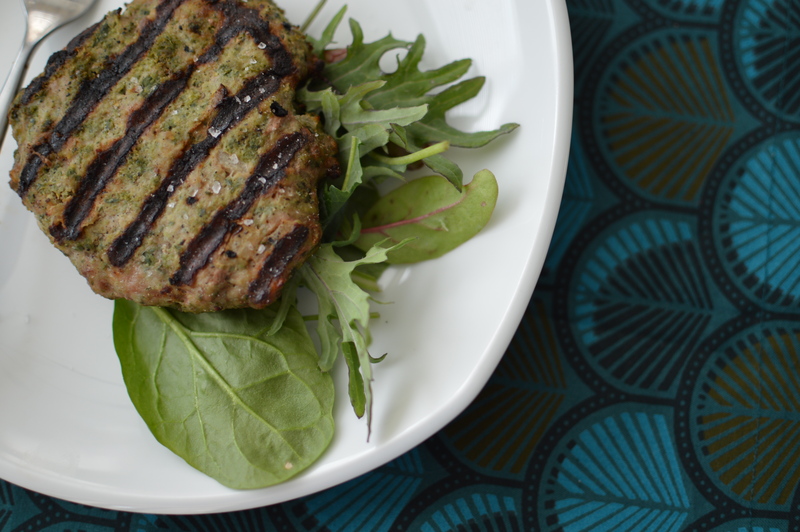 Oil the grates or the burger patties to prevent sticking. Grill 5-10 minutes and flip with a grill safe spatula. Cook until internal temperature reaches 160 degrees F. Transfer to a plate and cover with aluminum foil; temperature should increase to 165 degrees F while the burgers are resting. 4. 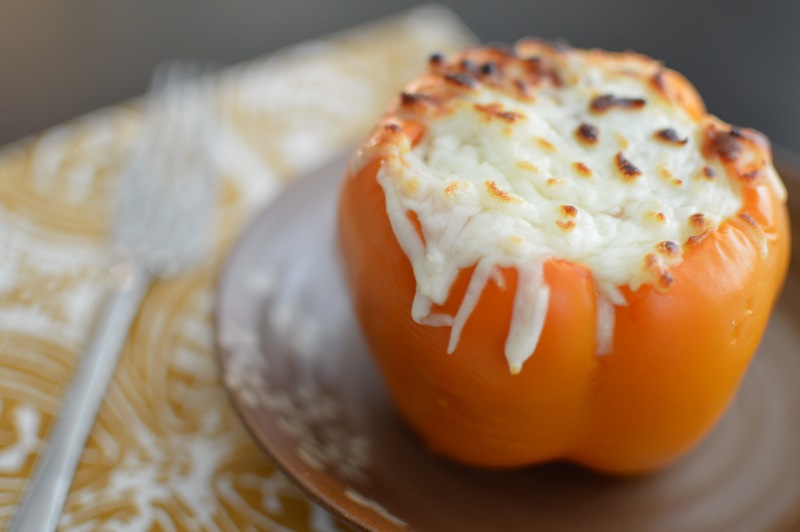 Serve over lettuce or on toasted buns with Sriracha sauce, roasted red peppers, and pepper jack cheese. 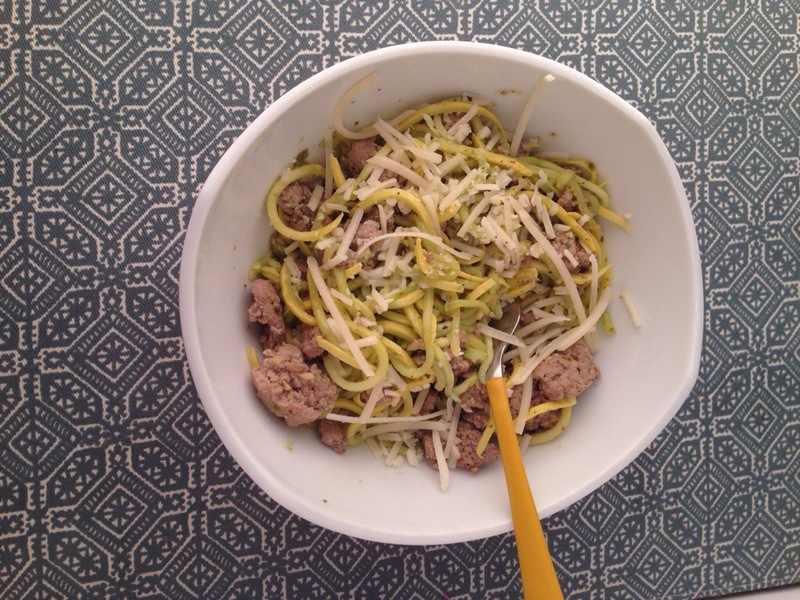 Check out other Recipe Redux ideas for January 2015! I’ve been cooking a lot, but not posting much lately. 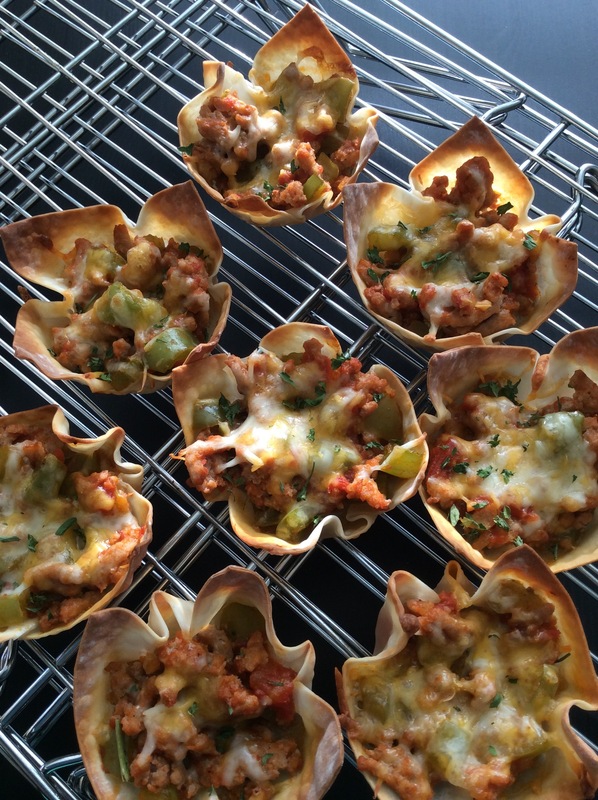 I wanted to share this awesome easy recipe with you today since I have a bit of time on my hands. Before coming up with this easy version, I was making a similar but more labor intensive stuffed egg roll recipe. 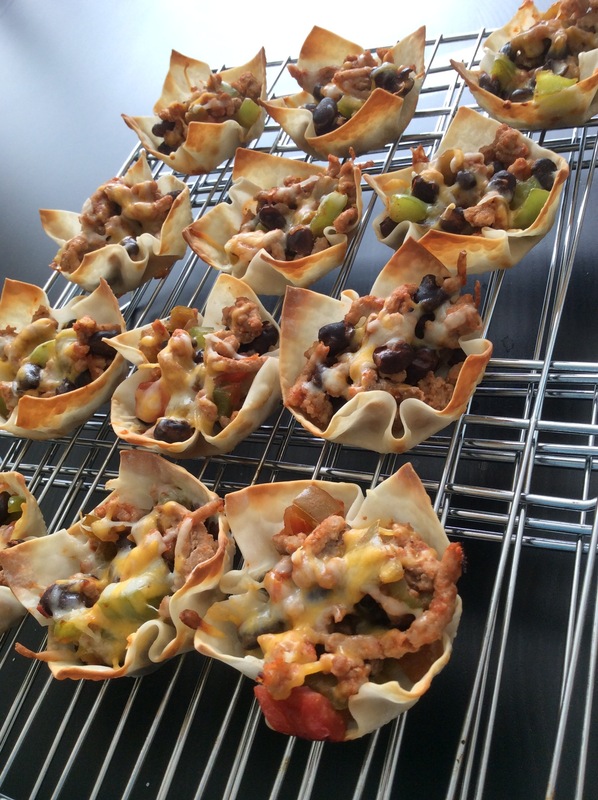 These taco cups are cute, crunchy, and satisfying. Serve them at a football party or pack a few in your workday lunch. They’re tasty hot or cold! 1. Preheat the oven to 400 degrees F and lightly spray two 12-cup muffin tins with cooking spray. 2. Brown the ground meat in a frying pan until no longer pink. Drain. 3. In a separate pan, saute together the bell pepper and onion until tender. Add to the ground meat. 4. Stir in taco seasoning, black beans, and salsa. Mix until well combined. 5. Press a wonton wrapper into each lightly greased muffin cup. Spoon a heaping tablespoon of the meat and vegetable mixture into each wonton cup. 6. Top each cupful with a pinch of shredded cheese and bake at 400 degrees for 5-10 minutes, or until the corners of the wonton cups turn golden brown but not burned. 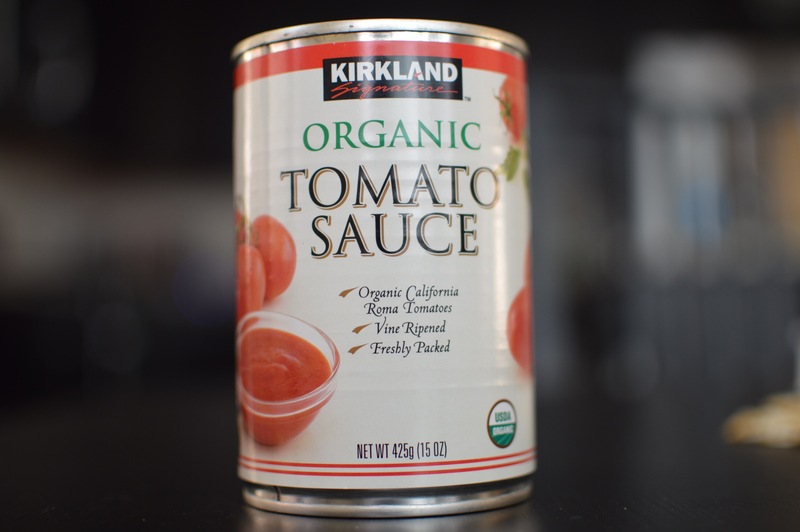 There are approximately 280 calories per four cup serving. Enjoy! When Colby and I moved into the new house, we had to learn a few things about homeownership. First of all, it turns out you have to pay a water bill. I didn’t really think about it since water was included in our rent at the apartment before. I figured we paid for a few months of water in our closing costs. NOPE. Found out the hard way when we came home to our water shut off a couple of days ago. Taking a shower just isn’t the same when you have to use a water bottle. But hey, I guess we got 2 weeks of free water out of it before they shut it off! Another thing I discovered is that our new fridge, while beautiful, does not accommodate a 21 lb frozen turkey in the freezer drawer. So it’s Thanksgiving in February, everyone! I followed my dad’s favorite roasted turkey recipe to cook the bird. He always said the recipe is “top-secret,” but after I asked very nicely for the secret recipe, he sent me a link to Alton Brown’s Roasted Turkey Recipe from Food Network. Not surprisingly, it’s amazing. 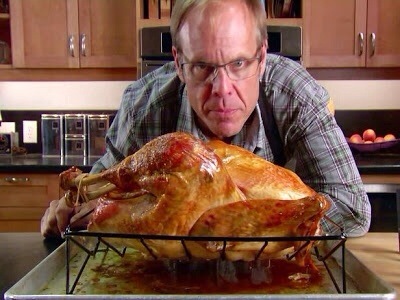 Alton Brown is the coolest, nerdiest chef on Food Network. I trust that every recipe he creates is perfect down to a science. Photo credit goes to Simply Recipes this time. I roasted the turkey on a weeknight… in the middle of the night. When it was finally done at 3am, the last thing I wanted to do was take pictures. I just wanted to eat that delicious crispy skin and go to bed. 1. 2-3 days before roasting, thaw the turkey in the refrigerator. Combine the vegetable stock, salt, peppercorns, allspice berries, and candied ginger in a large stock pot over medium-high heat. Stir occasionally to dissolve solids and bring to a boil. Remove the brine from the heat, cool to room temperature, and refrigerate. 2. Early on the day or the night before you want to eat, combine the brine, water, and ice in a 5 gallon bucket. Place the thawed turkey (with innards removed) breast side down in the brine. If necessary, weigh down the bird to ensure it is fully immersed, cover, and refrigerate or set in a cool area for 8-16 hours, turning the bird once half way through brining. 3. Preheat the oven to 500 degrees F. Remove the bird from the brine and rinse inside and out with cold water. Discard the brine. 4. Place the bird on a roasting rack inside a half sheet pan and pat dry with paper towels. 5. Combine the apple, onion, cinnamon stick, and 1 cup of water in a microwave safe dish and microwave on high for 5 minutes. Add steeped aromatics to the turkey’s cavity along with the rosemary and sage. Tuck the wings underneath the bird and coat the skin liberally with canola oil. 6. Roast the turkey on the lowest level of the oven at 500 degrees F for 30 minutes. 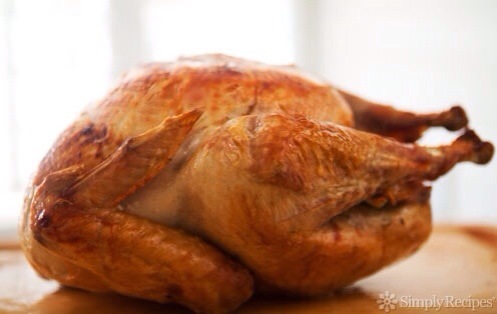 Insert a probe thermometer into the thickest part of the breast and reduce the oven temperature to 350 degrees F. Set the thermometer alarm (if available) to 161 degrees F. A 14-16 pound bird should require a total of 2 – 2 1/2 hours of roasting. My 21 pound bird took about 3 hours. Let the turkey rest, loosely covered with foil or a large mixing bowl, for 15 minutes before carving. You’re going to love this turkey! It’s tender, juicy, and flavorful. I’m sure I’ll be brining all my poultry from now on! 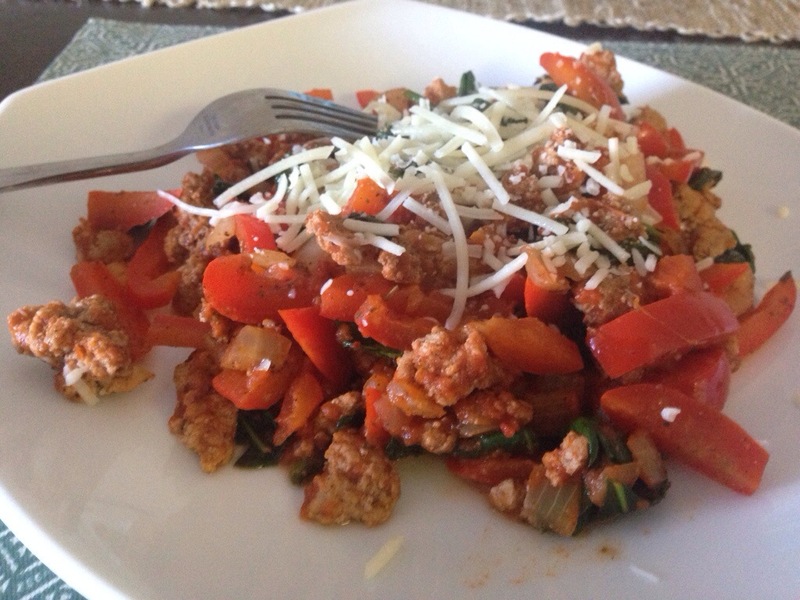 This sauté of turkey, bell peppers, spinach, onion, and marinara sauce topped with shredded cheese really hit the spot. It was quick and easy to make, which is key when you’re craving pizza fiercely! 1. Brown the turkey in a skillet, breaking it up into little chunks with a spatula. Once cooked through (no longer pink inside), set aside. 2. In the same skillet, heat olive oil. Add the diced onion and bell peppers. Sauté until tender, about 5 minutes. 3. Add the spinach and stir until wilted. Add the Italian herbs, ground turkey, and marinara sauce. Cook until heated through. 4. Serve with a sprinkling of cheese! While it’s not quite pizza, the flavors are spot on and the protein in the turkey will keep you feeling satisfied. 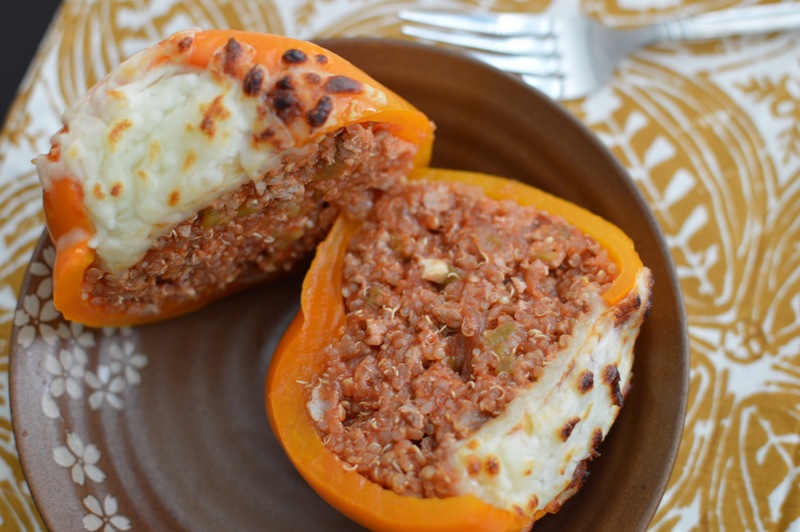 Have a healthy, easy meal on the table in minutes with this simple recipe! 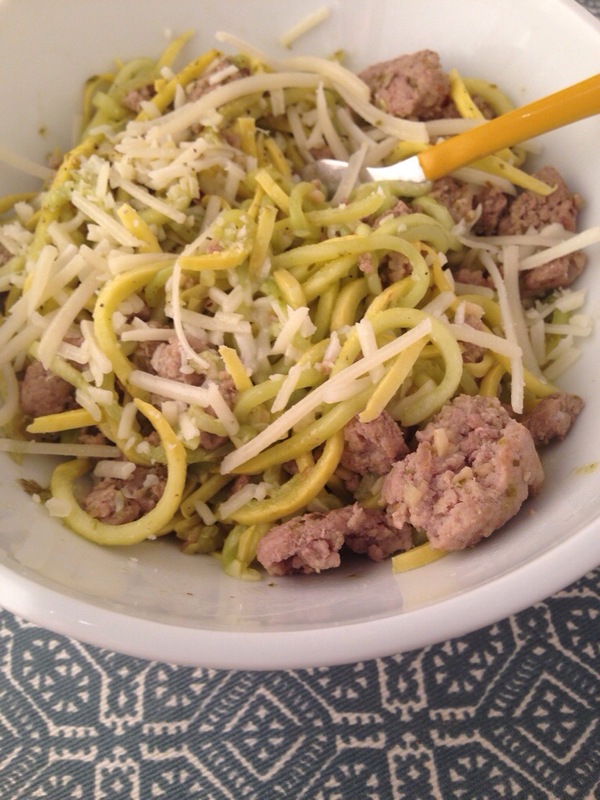 Spaghetti squash, zucchini, and yellow squash all taste wonderful with pesto sauce. 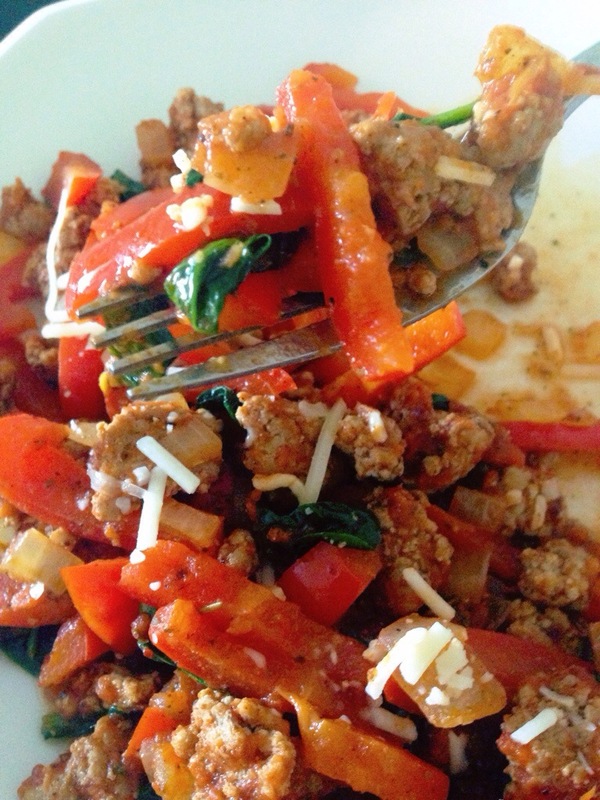 Add a little ground turkey for protein and you’re ready to dig in! 1. Spiralize the summer squash, or use a vegetable peeler to make noodles out of it. 2. Brown the ground turkey in a skillet. 3. Add the summer squash and pesto to the skillet and mix until heated through. Serve with shredded parmesan. I love this easy, lazy meal! If you cook a pound or more of ground turkey at once, you can keep it in the fridge for several days to make this meal even faster to put together.